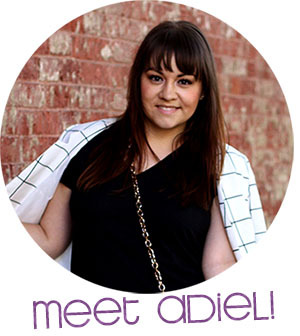 The minute I walked into Forever 21, the big, bold polka dots caught my eye. I knew immediately, it was coming home with me. 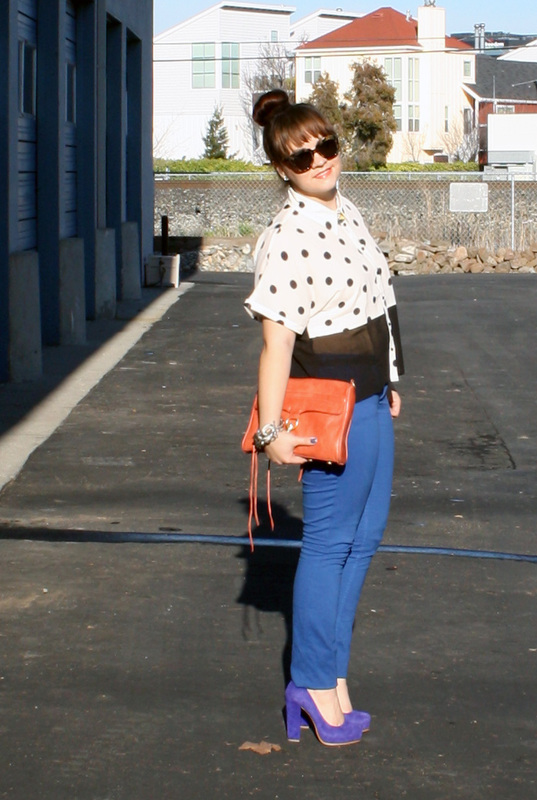 The polka dots, the sheer panel, the colorblocking--it was all just too good! As I was getting dressed, I found the hardest thing to be which outfit to wear--there were just way too many options! 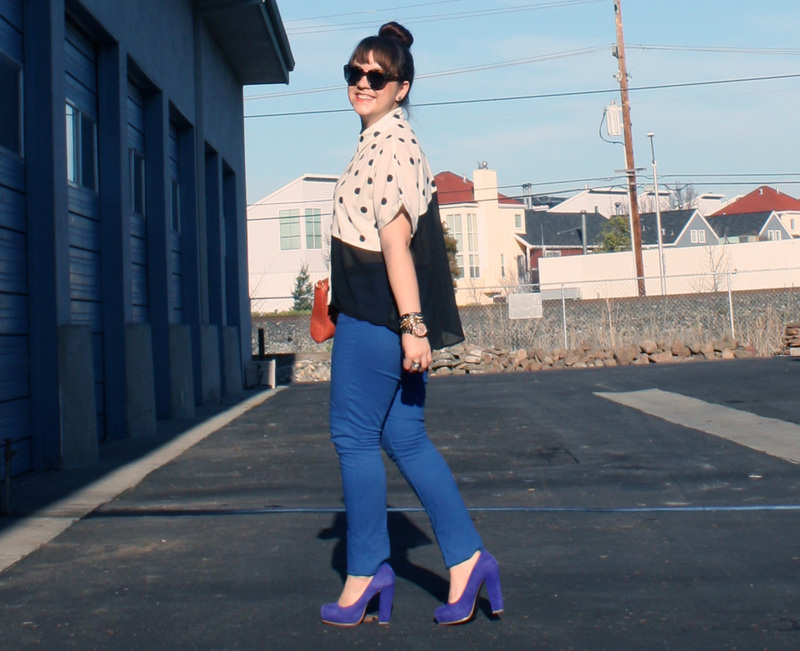 After trying on a few options, I finally settled on cobalt jeans and my blue suede pumps! My orange MAC seems to go with just about everything I wear these days, so of course I grabbed that! I realized the other day that I have a LOT of perfume samples. They're all over the place in my apartment and at my desk at work. As I find them, I've been collecting them in one spot and it's clear I need to find a storage solution. A bit of Googling gave me ideas of storing them in ammo boxes, a calligraphy nib holder, or a jar of sand. None of those ideas really seemed like the one for me, so now I turn to you? Do you have any ideas for how I could store the many, many little vials of perfume samples? OK, you have convinced me. 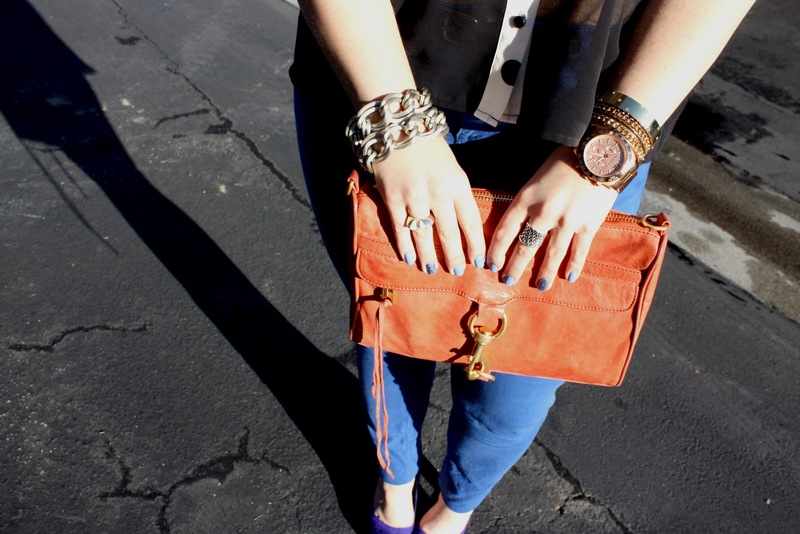 I need some cobalt jeans ASAP. Total rockstar. The color combo, and polta dots are sublime! Yeah you do! 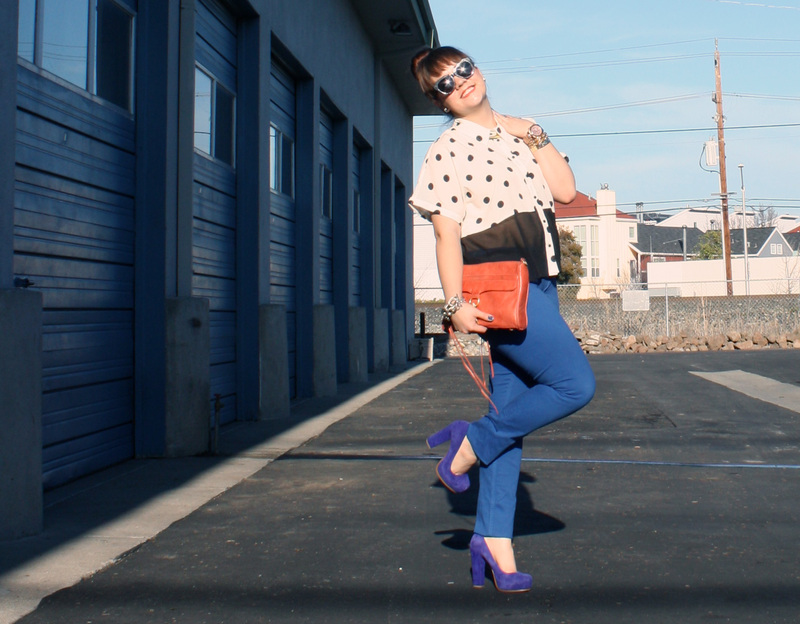 Cobalt jeans would look amazeballs on you! I love this outfit the more I look at it. Printer's block (plus you could intersperse corks if you don't have enough perfumes to fill it), lipstick caboodle/drawer organizer, fishing reels box, shadow box. [url=http://www.iystwowgold.com]wow gold[/url], These particular games gold will be certainly amazing, confortable, rather. All these games gold are the most useful footbring i've truly picked up in any number of years which means very tasteful i've truly exactly purchased my very own Third pair plus i however mean to pay for far more absolutely love these individuals. Precisely where should the purple color or shade proceed? it was subsequently so lovely! we would like that. Searching for saving up concerning theese games gold on a week, and thus used it in relation to in the retain when it comes to so extended together with their pretty much soo good. can you take them throughout repeatedly? I really like my [url=http://www.iystwowgold.com]wow gold[/url]! Common shorter grays specifications Ten was basically the primary games gold My spouse and i ever bought. I became these products 48 hrs in advance of x-mas together with the bucks my partner and i acquired. I was ever before acquiring these folks once believing citizens were likely to store them however i determined my self sun hat it had a lot of colors and styles which everybody will not have the similar point in addition to er or him relieved i purchased them all. In that respect there awesome cute plus i acquired Hundred or so remarks on them up to date. The greater reasons for these folks r right now there very good design and stylish. Up to now We have bought virtually any swindles on them. Nevertheless i will recomend keeping the cleaning up kit. I'm ording that cleaning supplies tonight if perhaps. I'm not going This approach PIECE OF ART To gain Destroyed!!!!!!!!! I like games gold and get compliments EVERYTIME I convey them! i really love [url=http://www.d3boy.com/]d3 gold[/url] having said that i dont like the particular bailey calls a great deal of. even though you may prefer to you want to keep flap all the way up, nevertheless tumbles doowwn. yoouur shorts never use as fast and loook pretty saggy. i wouldn't propose having bailey buuttons, nevertheless i might strongly suggest getting only the frequent vintage. they can be muuuch greater. 12, [url=http://mediati.org/]Cheap Carisoprodol[/url] - Cheap Carisoprodol - buy carisoprodol online no prescription http://mediati.org/ .